Kimo Eletronics also has a full range of products, and instruments for measuring and testing of High Pressure Compressed air lines, hydraulics, and oil pressure monitoring. We also have flow meters for compressed air, and manometers for high pressure lines. We also have Dew Point meters for compressed air lines to manage the system more efficiently and better. Some of our products have been successfully used in all industries like oil, gas, marine, diesel, process, chemical, fertilizer, and related. 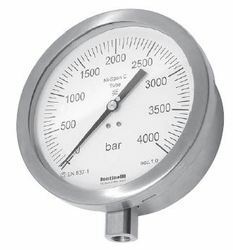 A full range of Manometers, Flow Meters, Dew Point Meters, and Temperatuire measruing for high pressure requirements. Our High Pressure Manometers, Transmitters, and Temperature Gauges are used in Oil, Gas, Petro, Atex, Ex, EEX, Marine, Diesel Engines, Cryogenics, Pharma, Chemical and Fertilizer Process, Cement Plants, and various Industrial applications. Atex - Ex-Precise Flow Meter for Compressed Air and Gases. Ideal also for the outdoor area Compressed air measurement and distribution Leakage measurement of Compressed air and gases. Flow measurement in vacuum systems. hydrogen with ATEX approval Flow measurement of corrosive, acid gases like e. g. biogas with different gas mixtures. Measurement of oxygen and natural gas at gas burners. The Fantinelli Manometer, firm was founded in Milan in 1878 by Diomiro Fantinelli, who was the first in Italy in making manometers. The firm was first moved to Busto Arsizia in 1921 ond then. in 1990, established in Solbiate Olona. Fantinelli family has always owned the firm and has managed it for four generations. Now the fifth one is present to continue its traditions. Here follows we list some of the oldest and most significant achievements granted to Messer. Fantinelli. - Diploma of Gold Medal granted by the Chamber of Commerce Industry and Agriculture in 1956 for firm seniority. In 1938 Adelio Fantinelli patented a “compensated metallic expansion pyrometer” that enriched the already large products range. The present-day Fantinelli S.r.l. has a range of products about traditional or special instruments and devices dealing in manometer with pressure and temperature measurement to meet specific requirements. 1 to 600 Bar Pressure. All Stain Less Steel, Water Tight, and Made for Heavy Duty Industrial Applications. Looking for High Pressure Instruments ?